Tang Dynasty China, 847 A.D.
AN UNSEEN FORCE threw Yue-ying from her pallet. The entire building shook around her and the rafters groaned until she was certain the Lotus Palace was going to be torn apart. Too startled to move, she crouched low with her hands over her head. They were all going to die. Suddenly the shaking stopped. With her heart thudding against her ribs, Yue-ying gradually came back to herself. It was dark and she was on the floor in her sleeping area. The walls of the pavilion creaked around her as they settled. Before she could catch her breath, the shaking started again. A cry of alarm came from outside the chamber. It was Mingyu. Mingyu needed her. 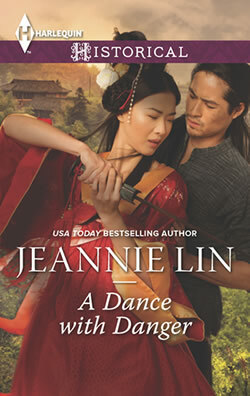 Yue-ying struggled onto her hands and knees, while a sea of silk tangled around her. Mingyu’s entire wardrobe had been tossed onto the floor. Yue-ying shoved the material aside and stumbled to the doorway, clinging onto it for balance. There was no door between the two compartments. A gray light filtered in through the windows of the sitting area and Mingyu was standing at the center of it, her long hair wild about her face. She was dressed in her sleeping garment and the pale cloth coupled with elegant lines made her appear otherworldly. She looked more like a ghost than a woman. 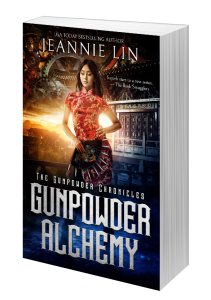 Yue-ying started to go to her, but the building lurched again and she was thrown to her knees. Mingyu fell to the ground as well and they scrambled toward one another. In an uncustomary display of emotion, Mingyu embraced her, clutching her close while the walls shuddered around them. At any moment, the roof would come crashing down to bury them. It was an eternity before the shaking stopped. Afterwards there was absolute quiet; a funereal silence as the inhabitants of the Lotus Palace held their collective breath, waiting. She and Mingyu remained on the floor, holding onto one another and too afraid to move. Then the hum of voices began. Mingyu let go of Yue-ying abruptly and straightened, smoothing her hands over her shift. Her chin lifted with a regal air and she was the elite courtesan again. Yue-ying tried not to feel discarded. She should be accustomed to Mingyu’s changing moods after serving as her personal attendant for the last four years. Mingyu could be warm and engaging, affecting a smile that lit the room brighter than any lantern, butwhen she was not surrounded by admirers, she would often become distant, lost in some inner world of her own making. “Heaven must be displeased,” Mingyu declared. She peered out the window with a thoughtful and disturbingly serene expression. Mingyu had perfected that look. Even Yue-ying found it difficult to read her thoughts through it. “That’s only superstition,” Yue-ying replied. The ground wavered once more, as if in argument. Yue-ying pressed a hand to the wall to steady herself, while Mingyu stood tall and still, a fixed point amidst the turmoil. Earthquakes were not uncommon in the capital city, though this was the most violent one Yue-ying had yet to experience. Everything that could fall had fallen. The dressing room where she slept was a disaster: silk robes were strewn all over the floor and the powder table had overturned, spilling pots and jars everywhere. She was lucky it hadn’t fallen on top of her. Madame Sun set the other girls to work clearing the parlors and banquet room downstairs. The Lotus Palace was one of the larger establishments in the pleasure quarter of the North Hamlet, also known as the Pingkang li. 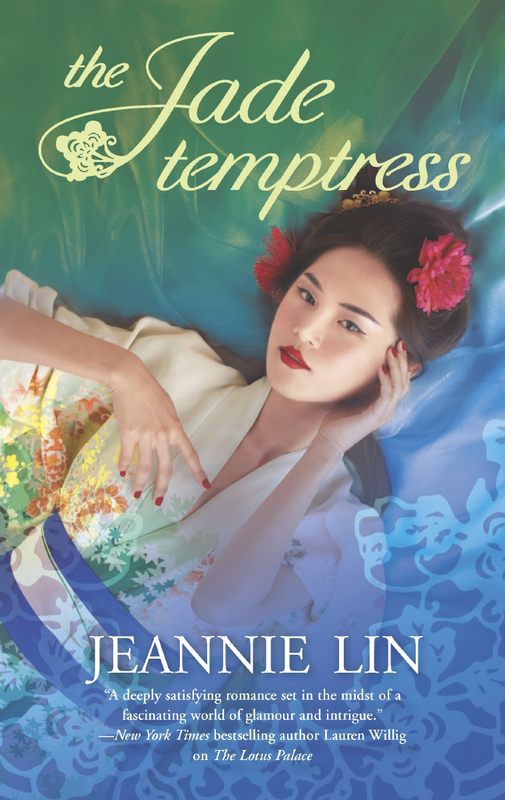 There were seven ladies, courtesans or courtesans- in-training, along with Old Auntie and Yue-ying. The courtesans all called Madame Sun ‘Mother’ and did whatever she told them. Even Mingyu, who was the most successful and thus most favored of the ‘sisters’, never disobeyed her. Yue-ying had heard that Madame Sun could be a demonness with her bamboo switch, though she had yet to witness it. Unlike the others, Yue-ying had no one to answer to but Mingyu. Also unlike the other girls, she possessed no literary or musical skills to elevate herself in status. Her fate had been decided from birth by a bright red birthmark that curved along her left cheek. The stain rendered her unsuitable for the pleasure houses, for who wished to invest time and money to train a courtesan with a ruined face? A prostitute required no such training. She was a maidservant now, but up until four years ago she had been nothing but a warm body. 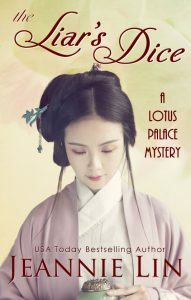 The Lotus was indeed a palace compared to the brothel where she’d once lived and she no longer hid her face behind a thick layer of powder. No one cared if a servant was ugly, and no one paid any attention to her when Mingyu was present. Yue-ying focused on setting their quarters back in order, righting the dressing table and picking the robes off the floor. She selected a light one that was suitable for the warm summer weather before shoving an armful of clothing into the wardrobe. Then she sorted through the cosmetics, salvaging what she could. Later, as she was fixing Mingyu’s hair, another tremor rocked the pavilion. The force of it was slight in comparison to that morning’s quake, but she inadvertently jabbed Mingyu’s scalp with the long pin she was holding. “Forgive me,” Yue-ying murmured after regaining her balance. Carefully, Yue-ying inserted the pin into a coil of dark hair to keep it in place. She worked in silence, mentally going over the ever-growing list of tasks she needed to accomplish that day. “What if something happened to me?” Mingyu asked out of nowhere. “You were not afraid of earthquakes yesterday,” Yue-ying reminded her gently. Yue-ying could see Mingyu’s eyebrows arch sharply in the bronze mirror. Even agitated, she was still beautiful. Mingyu said nothing more while Yue-ying finished dressing her in a robe of jade green embroidered with a floral design. The courtesan resembled the paintings of immortals with her luminous skin and eyes that were mysterious and dark. The silk swirled around her as she strode from the dressing room. Her expression was tranquil, but her movements were anything but. Yue-ying moved with purpose once Mingyu was gone; sweeping the parlor and making it presentable, propping up the broken screen that covered the bedchamber entrance as best she could. The inner rooms she left to be sorted out later. She was right to move quickly. It wasn’t long before one of Mingyu’s patrons came to call, even though it was only the middle of the morning. Apparently, the earthquake had woken up the city and everyone was eager to gossip. Taizhu, an appointed court historian, was an occasional visitor to the Lotus, though he had been coming to speak with Mingyu quite often lately. There was a touch of gray to his beard and his face was creased with more laugh lines than frown lines. For an academic, he was an ox of a man with thick shoulders and arms. The indigo color of his robe spoke of his elevated status as a member of the Hanlin Academy. Yue-ying went to set a clay pot onto the tea stove in the inner chamber. It took her a moment to light the charcoal inside it. When she returned, the elderly scholar was already standing beside the wall with ink brush in hand. “A new Son of Heaven takes the throne. Who is it now? Hard to say, when each one seems like the last. But this time the Earth has chosen to pay homage. With a coy look, Mingyu took the brush from the historian’s hands. She presented an elegant contrast to Taizhu’s warrior pose, with one hand holding her sleeve, her brush flowing in small, graceful movements. The old scholar generously read her addition once she had finished. “This humble servant thanks the kind gentleman for precious words. From a revered talent who has studied the Four Books and Five Classics. It was a common game in the Pingkang li, the dueling of words back and forth. Yue-ying slipped past them and headed back to the inner chambers to see to the tea. She had little grasp of the sort of language the scholars enjoyed. The water was ready. Yue-ying measured out tea leaves into two cups and set the pot beside them on the tray. Another guest arrived as she returned to the parlor and she nearly ran into him, tea and all. Bai Huang was a well-known fixture of the entertainment district. He was a night-owl, a flirt, a spendthrift and an eternal student, having failed the imperial exams three times. He was dressed in an opulent blue robe and his topknot was fixed with a silver pin. “My lord-” She started to mumble out an apology while trying to keep from spilling the tea. She was met with easy laughter as the young aristocrat reached out to steady the tray. His hand closed over hers and her pulse did a little leap, despite itself. Bai Huang carried the tray over to the party himself, forcing Yue-ying to follow him in an attempt to retrieve it. Her ears were burning by the time she managed to wrest the tray from him, but the nobleman was oblivious. Mingyu placed a warning hand on Taizhu’s sleeve, but Bai Huang merely accepted the remark with a chuckle. He remained deaf and blind to insult, like a contented frog in a well. Lord Bai had taken to openly courting Mingyu over the last few months, composing effusive poetry about his loneliness, his sorrow, his aches and his pains which he would publicly dedicate to Mingyu, reciting verses whenever present company allowed. If he never had to speak, then Bai Huang and Mingyu would have been perfectly suited. He was the picture of masculine beauty with prominent cheekbones and a strong, chiseled jawline. His eyes were black and always able to catch the light, highlighting the perpetual quirk of amusement on his lips. He bore the high forehead that was considered a sign of cleverness, but anyone who had come across Bai Huang knew better. Yue-ying made her own effort to keep the peace by pouring hot water over the leaves and setting out the cups. There was no better reminder to be civil than tea. She had to fetch another cup for Lord Bai. After preparing his drink, she glanced up to catch him watching her. The look was only there for a moment before he took his tea. “Your concern touches me deeply, Lord Bai,” Mingyu interrupted in a soothing tone. Bai Huang looked pleased. Taizhu shook his head, fingers pinched to the bridge of his nose. Yue-ying went downstairs to fetch a plate of red bean cakes from the kitchen as it seemed the men would stay awhile. When she returned, the old historian had turned the conversation back to the imperial court. “This is an opportunity to advise the Emperor that he must change course. Heaven has given us a sign. Earthquakes and floods have been known to topple dynasties,” the historian pointed out sagely. Bai Huang was already shaking his head. “A sign of what? It sounds more like superstitious doom-saying,” he said with a bored look. “What does it matter if it’s superstition or not? If such a disaster gains the Emperor’s attention, then it can be used as a means to an end,” Taizhu argued. “This morning’s disaster serves as a better excuse for a couple of friends to complain over tea,” Bai Huang contended, lifting his cup. He attempted to drink, then frowned and peered into it, finding it empty. 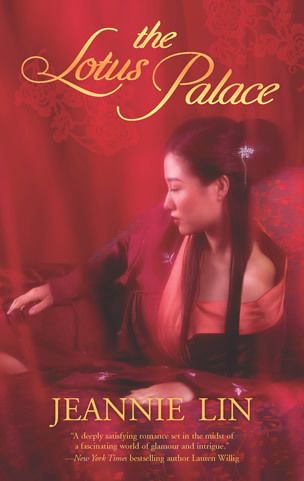 As Yue-ying bent to fill the empty cup, Bai Huang startled her once again, halting her movement. “What do you think, Little Moon?” he asked. Mingyu’s mouth pressed tight at the casual endearment. Yue-ying glanced at Bai Huang. Dark eyebrows framed his face, giving him a serious expression that was contrary to his usual carefree manner. The nobleman had never spoken directly to her in such company before. “Has the earthquake provided you with any signs?” he persisted. The room fell silent. Old Taizhu affected a shallow cough and sipped his tea in silence. Bai Huang was the only one unperturbed. He continued to look at her, smiling crookedly as he waited for an answer. His gaze on her was insistent, but not unkind. Yue-ying looked nervously to Mingyu before answering. Yue-ying immediately set the pot down without refilling Lord Bai’s cup and retreated toward the door. Bai Huang would find himself cut out of the conversation for the next hour, perhaps for the whole afternoon if Mingyu decided he deserved it. They continued on to more pleasant topics: the upcoming festival on the double fifth and the number of candidates who had passed the exams that spring. Was Lord Bai deliberately trying to provoke Mingyu? Or had he simply forgotten that the courtesan was very strict about anyone being so familiar with her attendant? At the door, Yue-ying turned to see Lord Bai staring at his still empty cup. After an expectant pause, he reached over to pour for himself since Mingyu wasn’t being amenable. As he sat back, the young nobleman directed his gaze across the room and caught her watching him. He raised the cup to her in salute, eyebrows lifted. Her heartbeat quickened and she swallowed past the dryness in her throat. 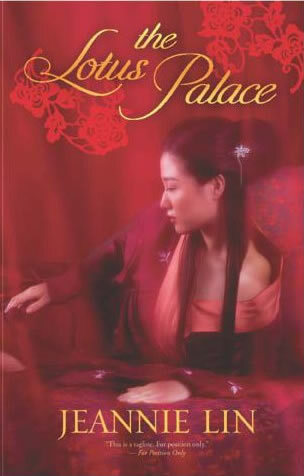 Yue-ying might have been unaffected by his beauty, but she wasn’t completely indifferent. Any other woman would have been flattered by his show of interest, but she merely turned, head held high, and exited the parlor. Lord Bai knew exactly what he was doing. By the time Yue-ying went downstairs, the public gong had sounded eight times in the distance to signal the Goat Hour. At a brisk pace, she was able to reach the walls of the East Market within the next half hour. The merchants went about their business as usual, though apprehension hung over the stalls and shops. Yue-ying moved through the rows ruthlessly, gathering the things that Mingyu needed as well as requests from the other girls. The courtesans didn’t have the leisure of being able to browse the markets. They were often entertaining late into the night so their days were better spent resting up. Despite this small measure of freedom, Yue-ying didn’t believe in dawdling. A craftsman had visited the Lotus once, showing off a fountain that served wine. The contraption was tall, built in the shape of a mountain, and had a mechanism to draw wine out of a built in well without the use of hands and pour it into a waiting cup. He had opened the encasing for her, revealing the wheel and levers. It was an illusion that everything operated so smoothly on the outside, while on the inside there was constant turning and toil. She was that wheel. By the time the market gong sounded the start of the Monkey Hour, her basket was full and she’d finished her rounds through the shops. Her last visit was to the local temple. Mingyu was convinced that the earthquake was an ill-omen and wanted Yue-ying to give an offering on her behalf. The temple courtyard was crowded that afternoon, almost as if it were a festival day. Perhaps Mingyu wasn’t the only one who felt that the angry heavens needed to be appeased. Yue-ying went to the fish pond at the center of the courtyard to pay her respects to the tortoise who lived among the rocks. This would be her one indulgence in her busy day. The ancient creature lifted his head high as if to examine what all the commotion was about. His skin was rough and dusty and there were wrinkled folds on his neck. “Old Man Tortoise,” she called softly and considered it a good omen when his eyes flickered languidly toward her. The whorled patterns on his shell resembled the octagonal pattern of the Taoist bagua symbol. Yue-ying had heard it told that the tortoise was over a hundred years old. He had come from a faraway land, across the ocean. Those black eyes had seen more than she ever would. She had enough on her mind today without Lord Bai trying to complicate things for his own amusement. Mingyu had been agitated for days and nothing Yue-ying said or did could soothe her. “Why is Mingyu never happy?” she asked the ancient creature. The tortoise had no answer and Yue-ying’s moment of rest was over. She left him to his afternoon sun and continued on to the main altar room. As she paused outside to remove her slippers, someone ran into her, toppling her basket. Gasping, Yue-ying scrambled to salvage her goods. The lychees she’d bought were delicate and very expensive. The round fruit was scattered all over the bamboo mat and she hurried to pick them up before they were trampled. She recognized who it was even before looking up. Huilan was another of the famed beauties of the quarter. Her voice was often compared to the trill of a song thrush, but she didn’t sound so pleasant now. With a sigh, Yue-ying packed everything back into her basket while continuing to kneel at Huilan’s feet. Finally she stood. “They were at the front of the farmer’s quadrant in the East Market. There were only two baskets of them and the price was very steep,” she reported, carefully maintaining a cordial tone. For a moment, her tone sharpened. A strange look crossed her face, but then it was gone. The so-called Four Beauties of the North Hamlet weren’t necessarily in competition with one another, but they were mentioned and compared so often that a subtle rivalry had emerged. Though Huilan was outwardly sweet-voiced and sweet-faced, she was as shrewd as Mingyu when it came to maintaining her elevated position. Huilan turned away, concluding their exchange with no further attempt at politeness. She glided across the courtyard in a cloud of yellow silk and disappeared through the gate. Yue-ying nudged off her slippers and entered the shrine. A spicy, camphor-laced scent filled the room from the incense smoldering on the altar. Setting her basket aside, she took three sticks of incense from the holder at the altar and held the ends to the candle flame until they ignited, releasing the fragrant oil in the coating. Clasping the incense between her palms, she bowed her head as the smoke curled a lazy spiral around her. She tried to form a coherent prayer, but all she could think of was the angry rumble of the earth that morning and Mingyu’s pale and frightened expression. So she asked the goddess Guan Yin to look over and protect them, in any way she might see fit. When she was done, Yue-ying dropped several coins into the alms bowl and paid one final visit to the old tortoise before leaving the temple. She saw that Huilan hadn’t gone far. The courtesan was standing at the foot of the nearest bridge. The sun caught the reddish streaks in her hair as a young man in scholar’s robes approached her. Yue-ying ducked her head and kept on walking to give Huilan her privacy. The temple was known as a place where scholars and candidates congregated, and it was a popular place to meet and gain new admirers. As she traveled along the outer edge of the market to return home, her way was blocked by a sizeable crowd that had gathered along the canal. Although she was expected back at the Lotus, Mingyu might be pleased to have some gossip at hand to spark conversation with her visitors. Yue-ying ducked and elbowed her way through to the front to see what was going on. Down below, a man stood beside a boat that had been pulled out of the water. He wore the uniform and headdress of a constable and towered over the other men. She was close enough to see his face, which was unfamiliar to her. He had an austere and unpleasant look about him. Not a man one wanted to see angry. Whoever this was, he was new to the ward. Perhaps brought in by Magistrate Li, who had been appointed just before the new Emperor took the throne. The constable gestured to the other men in uniform, who moved quickly to follow his command. Yue-ying was so eager for information about the tall stranger that it took her a moment to realize why the magistrate’s enforcers were gathered in the waterway. There was a body lying in the boat at the edge of the water. An arm poked out from the length of canvas draped over the vessel and the skin covering it was black and rotted.